Two new books this summer! We are thrilled to announce our tenth title, coming this summer, Green Light to Paradise by J. R. Dwornik! Milton, ON – Science fiction and fantasy publisher Brain Lag is proud to announce the August 4, 2016 release of GREEN LIGHT TO PARADISE by J. R. Dwornik. In this fun new science fantasy, super powers aren’t something to celebrate, but to fear. Private security force Sentinel keeps humanity safe, but Kali, infected with superhuman bad luck, finds Sentinel up to no good instead. 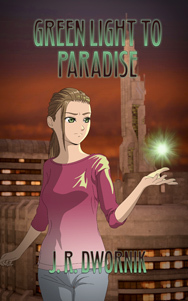 GREEN LIGHT TO PARADISE is the second novel by author J. R. Dwornik. His first novel was the 2011 epic fantasy RUINS OF CHANGE. Written in the style of a Japanese light novel, GREEN LIGHT TO PARADISE will feature original illustrations from four different artists. GREEN LIGHT TO PARADISE will be released during Gen Con (http://www.gencon.com/), North America’s largest table top gaming convention, taking place August 4-7 at the Indiana Convention Center, 100 S Capitol Ave, Indianapolis, IN. Brain Lag will have a booth in the exhibit hall and the author will be on hand. The book will then be available for purchase by the general public in paperback (MSRP $15.99 CAD) and ebook (MSRP $2.99 CAD) formats in online and brick-and-mortar bookstores everywhere.